Our truly talented masons will create for you the perfect outdoor fireplace. The climate in Texas is always changing but having an outdoor fireplace allows you to enjoy the warm glow of a crackling fire even on a crisp, cool fall day. Our team can create a truly remarkable space for you and your family to enjoy. With numerous enhancements, we can make your outdoor fireplace into a setting similar to your family room. With the help of the Ember Shop, you’ll be the envy of the neighborhood. 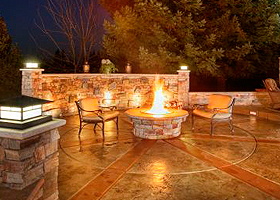 From our outdoor kitchens to fireplaces, you’ll never be bored or without a means of entertainment. Our locally owned business offers you a unique selection of products to choose. Using only the best brands in the industry, trust you're getting ace customer service.